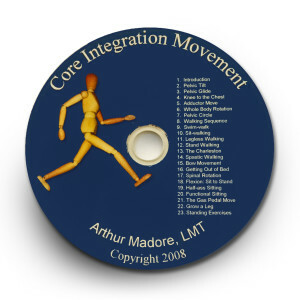 The Core Movement Integration DVD contains 23 sequenced movements with Arthur Madore, LMT as the model and narrator. This DVD covers the basic movement patterns that underlie most activities of daily life. 11 different deconstructions of the walking movement from supine to sitting to standing. You get to focus on one part at a time. Getting out of the bed easily. Turning connecting legs to head. The idea behind this DVD came to me because so many people had difficulty remembering the details of Core Movement Integration. It is intended for people who have had a session with Arthur and want to better remember the nuances of good, comfortable movement. It is also a good introduction to whole body movement. The language is clear and simple. This handout is specifically intended to be a resource for my own patients so they can better understand their home care program. It is also a resource of ideas for other therapists to try out in their own practice. Medical researchers may find some of the statements as working hypotheses for some clinical trials.